The Story: 'Background first!’ was an important tip given by prominent underwater photographer Mark Strickland during an underwater photo workshop organised by Bluewater Travel in a trip to Socorro in 2017. I was new to underwater photography. 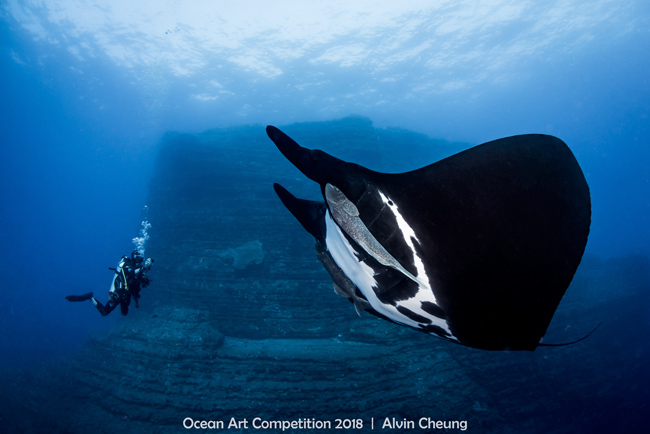 So during a dive in the famous El Boiler when this giant oceanic manta ray suddenly showed up from the blue, I realised that the chance of getting a decent shot of it was slim due to the distance and the presence of too many divers around it. I remembered 'Background first! '.